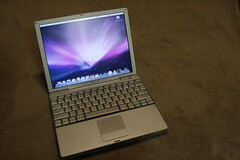 I'm selling my beloved Apple 12" PowerBook G4 on eBay right now. The auction ends tomorrow night, Saturday, at 5pm Arkansas time. If you're already an eBay-er, like myself, great! If not, you should really look into opening an account. If you stick around here long enough, I'll have you set up with my top 5 best sites online, and eBay is one of them. Don't be afraid to jump in. It's easier than you think. I love that PowerBook. About a month ago, I found a really great deal on an Apple MacBook online. As much as I loved the portability and aluminum-ness of my PowerBook, I took the deal. I'm loving my new MacBook. Anyways, the auction ends tomorrow night. If you are in the market at all for a laptop, this thing is an absolute powerhouse. Honestly, this is a perfect computer for anyone, unless you're editing tons of multi-camera videos in Final Cut Pro, or processing thousands of photographs daily. But if that's the case, I bet you're already covered on laptops. Oh, and if that's the case, call me if you need a helper. Mom always said I was a good helper.